I suggested a notification when the moon goes void and clear and the developer responded, made it happen. iLuna went from being a good app, to being great app. Now another suggestion (if its even possible), the app icon on my home screen (talking cell phn here, where most ppl access iLuna), if that icon could glow/be red while the moon is void and its default white on black when clear, that would be stellar. The notification is great, love it thx, but we’re always looking at our home screens, it would be a luxury if every time I looked at my home screen I would see the iLuna app either red, or black. Remembering void/clear times is a chore, sometimes I set a timer, but then sometimes I forget the moon is void (especially if its a long void). Again, not an app designer, don’t even know if this is possible. ILuna is the best! Always know when the Moon is void. I love the alerts! I was always looking info up online from several different sources. This app has all the info I need. Worth the $ I paid. I'm in the habit now of checking iluna for moon phases. Love it and they keep improving! I use this app to help me designate times for appropriate manifesting and also when to avoid casting times. I appreciate that it gives me an overviews and insights for certain houses. Great app. a useful tool for enhancing my busy life experience & daily interactions/plans. succinct event descriptions provide a refining of intuitive and greater influences from time. easy to use & i am grateful to have this tool so accessible. A beautiful platform to follow the moon. Love it. I need to know void of course. This is perfect!! Great app for basic astrological planning. I use this everyday planning and setting up special events. Thanks so much for this amazing app.! I really enjoy this app! I don't normally pay for apps so I was hesitant but all the free moon apps weren't impressing me. Very easy to use. Very helpful. Life changing for sure! My only complaint the Pisces moon description is always party cut off! I would really like to read the whole thing :-). Please update this!! Mansions of the Moons are AWESOME...but. After January ALL OF THE DAYS READ AL JABHAH. Please fix? 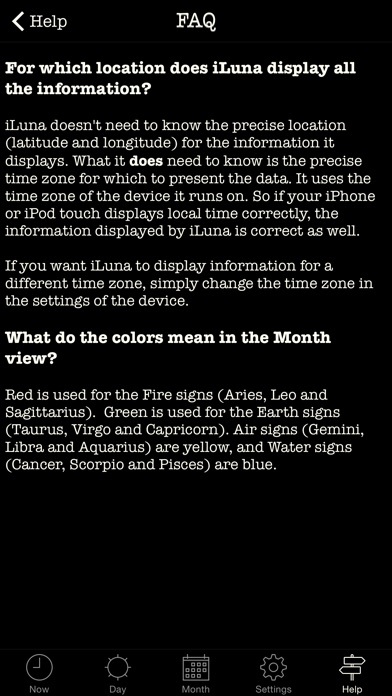 Very useful for this astrology geek! I have been using this App for years. It is accurate and so pretty to look at. It cheers me up. 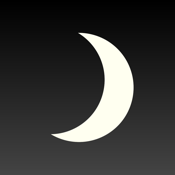 This app makes it super easy to keep up with moon phases and signs. I highly recommend it! I like this app but as one reviewer pointed out it’s still not displaying moon phases correctly. For example, it’s saying September 1, 2016 is void of course all day in the full calendar version (entire day is grey). The day version does appear to be correct so something is clearly amiss. I personally don’t care for the Arabic moon phases. I think they should be a separate app for those who follow them. It’s too confusing to me to mix up the Western with the Arabic moon phases in my opinion. The old app was much more elegant. I tend to use just the whole calendar to see at a glance if the moon is void all day so it’s kind of important to me for that information to be accurate though I’ll always be checking it against other sources. I use this app every day. I like the "now" and the daily views. The information is easy to understand. I do wish that in all the views there would be an indication of the present date and on the "now" view, I would also like the current time. I appreciate the notifications. One other item on my wish list would be the ability to use the app in landscape as well as portrait mode. It would help my less-than-perfect eyes read the info more easily. This is a helpful app. Thanks for all the work that's been done to provide it. There is so much info in this app. Definitely worth it! Great app for daily use! Love this app! Simple to use, clean interface, accurate information! Moon void of course alerts plus daily view and monthly view helps in planning. Worth the money. I had this app on my 5s and the moon phase descriptions were correct. I have the updated app on my 6s and the new moon phase description is missing, and the other phase descriptions are incorrect. I checked online moon phase sites to confirm this. Please update with corrections to make this app great again. I have tried quite a few other moon phase apps and I still keep coming back to this one. I like how it gives you all relevant data at a glance, including "void of course". Love this app. I follow moon in void. So I have this info available at all times, especially when I'm ready to make a purchase. I love this app and refer to it daily. I like to keep in touch with the phases of the moon and enjoy the way I can set the tone of the day energetically in what feels like synchronistic flow! I like it. Voice over is pretty good. I could use some help with the explanations. I really enjoy the app. I use it mainly to follow moon phases and it is easy to access. Simply swipe to advance moon phase, time and meanings. The calendar function allows quick view of all changes in the month. The astrological signs are a plus! App works smoothly. Great app for your daily planning. I use this for shopping, haircuts, planting and so much more. I use it all the time. Love the accuracy and info. Very cool app. Simple and attractive. Easy to use. Very helpful for keeping track of Moon Phases and related info. Love the notification feature. Great app and use it daily! I love the notifications that are sent to let you know the phase changes- how convenient is that?! Makes it so easy to garner and use the moons vibrations! I have used this app for years. Extremely user friendly. In a glance , see when moon is ' void of course ', glance back in the past, project in the future. Universal timing at your fingertips.. I really like this app from a functionality standpoint. Being that I've only recently developed an interest in tracking the moons phases, iLuna is very easy to use and informative. I don't know enough yet to determine the accuracy of the information, but it's still fun to use. iLuna is very helpful, easy to use and accurate. I'm glad I have it! Love it, so easy to use and reference on the fly! Great app for keeping track of the moon's placement. Seems accurate. I like that they keep track of the void of course. Mansions Are Great! Void of Course EVEN BETTER!! I took a class in Lunar Mansions about 4 months ago and find this feature very helpful, but that Void of Course info is my go to when I need to do something disagreeable and I want to avoid any blowback. Easy interface. A great app overall! It's Fixed! I'm in love again! Excellent for awareness! Very clear to what information you need that may affect your day and decisions. Amplifying information is provided. Superb App nothing else out there like it! Thanks for the bug fix! This app is spot on and I always plan my lunar mansion rituals around this app. I love this app! It is the only app I get notifications on my lock screen — no joke. It has so much information about the moon cycles that is so useful. I love using this app-and highly recommend it. And there are new features which provide even more comprehensive information. This app functions beautifully. Thank you. Edit 8/2017: Still awesome. Great resource & flawless performance. Thank you. This app contains all the information I would have spent time plucking through websites for, but at the tap of a finger. Keeps you up-to-date with the cycles throughout the day and month. Easy to use. Nice and simple. Thanks! Love the simplicity, but has everything I need. 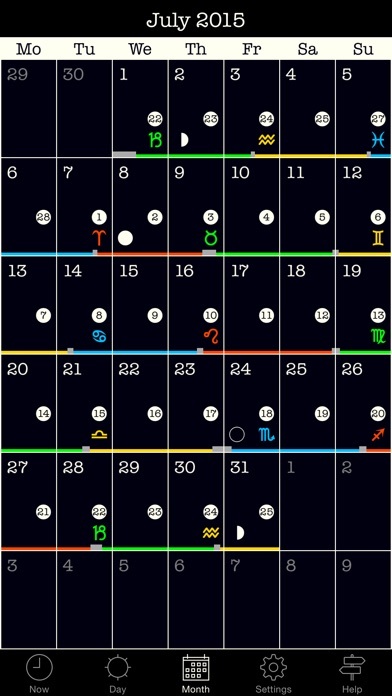 I personally like to see a visual of my month, with the various moon and planetary phases and this has it, it a very visually pleasing form that is easy to read and quickly see everything. 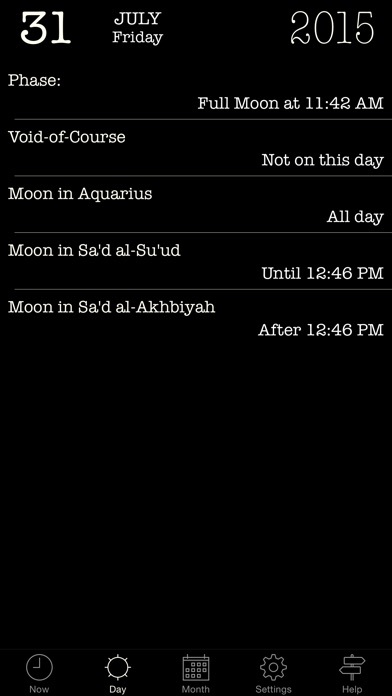 This would be perfect but for one exception: The App shows an Al Iklil moon for well over a month beginning in the later part of October. I've dropped my rating to 3 stars because this glitch has not been fixed in all these months. For simplicity and ease of use no other app (or the full web site) comes close. Great app. The info is always there for me. And amazingly so simple. I recommend it! I've had previous versions of this app, and let me tell you! The current version is very much improved. The visuals have been updated too - very nice! I like this app very much and look forward to seeing whatever new features the developer chooses to add. I like all the information provided, it's in a good format. All the information is useful. Thanks much for this app. All the details I need all in one app!! Great! I refer to it all the time. Quick and easy! The ILuna App gives me a lot of information regarding the progress and changing of the Moon cycles… It is an excellent reminder for when the moon goes through a change of phase… You should buy this app! I actually just wanted to know when the Moon was waxing, full, waning or new. iLuna has so much more to offer and it really is easy to use. Great App for Daily Planning!!!! This app is a great little tool for keeping up with what's happening with the Moon. I love it and use it every day. At first I gave it four stars because one of the issues is that it doesn't always take you to what's happening in this moment when you press "Now" on the bottom menu. I found that the workaround for that is to go to the calendar, which is an AWESOME feature and click on today's date. I am giving this five stars because I use this app for daily planning and truly it's become indispensable!! 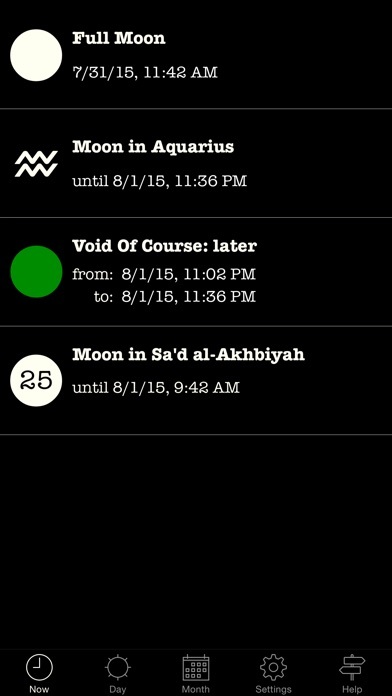 The app and the pop up notices for the beginning and end of a void moon is very helpful. Best Moon/Astro app I have tried! I use this all the time! Quick & easy for basic moon/astrological references! Tried many but none compare to basic info and ease of use like this one!!! Thanks! Won't waste your time with useless stuff. Just the highlights, anything deeper and I would want to run a whole chart anyway. So, as a professional Astrologer. I find this app really useful. I rely on the app's banners each day in planning my meditation. I've been using this app for five years. I have recommended it to several people.Love where it has been improved. Wouldn't it be cool if we could have a Mercury retrograde section?